Sana Electrical Ltd are electrical contractors in Essex who also cover Kent, London and Hertfordshire as well as the surrounding areas. They are experienced in all aspects of domestic, commercial & industrial electrical work and specialise in large electrical projects. Offering competitive pricing for your domestic, commercial or industrial electrical installation in London. Their electrical services include lighting controls and complete BMS controls (Building Management System), Sana Electrical Ltd can meet all of your commercial and industrial electrical installation needs. Whether it’s a new build that requires complete wiring or an entire security system installation for your commercial property, Sana Electrical Ltd have the skills and experience to provide a high-quality service at all times. Sana Electrical Ltd offer electrical commissioning in Kent, Essex, London and Hertfordshire for all types of building projects. With vast experience in providing electrical commissioning for projects of all sizes you can rest assured that Sana Electrical Ltd will ensure all your electrical systems are safe to use and properly set up. With their significant expertise in Building Management Systems Sana Electrical Ltd can install and maintain BMS controls in Essex, Kent or Hertfordshire, they offer expert advice on what systems would best suit the needs of your property. From heating and air conditioning to lighting and security systems, BMS controls will ensure you can control all your building management systems with ease. 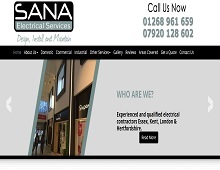 Whether you need electrical installation in London, electrical commissioning in Kent, BMS controls in Essex, lighting controls in Hertfordshire or any related domestic, commercial or industrial electrical services contact Sana Electrical Ltd today.